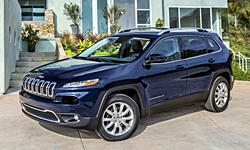 What has been the overall reliability of the 2016 Jeep Cherokee with AWD and 2.4 four cylinder? I have had mine since early March 2016 (built Feb-2016) and it has not had any problems so far, it has the 4 cylinder engine 2.4L that I find great for my needs, I do not tow and live in a flat land area, this engine with the 9 speed automatic is very responsive. It is equiped with Active Drive-I 4x4. I am very happy with this purchase. Do you have any gas mileage data you can share with me? Gas mileage is not really a concern of mine with a 4 cylinder engine but I have noticed that it shows on the computer from 24-25 miles per gallon (U.S gallon) around town. I have an 2015 Limited , fully loaded with AD-II and the V6. Getting 24-25 around town and 28 on the open road at 80 MPH or better.